HASTINGS CITY IS HOPPING MAD FOR EASTER! If you have kids and you’re stuck for activities to do this Easter, then listen up because we’ve got it sorted! Thanks to Upstart Magazine, we would love to have kids between the ages of 5-13 to participate in the Upstart Hastings City Bunny Adventure running from April 1 to April 14, focused in and around the Hastings City. We have over 20 stores in Hastings City who are participating in this promotion, and each shop will have an Easter bunny sticker hidden on the front of their store window. From April 1, kids can pick up an entry card from any one of these participating stores or at the Hastings i-Site. All they need to do is find one of the stores in Hastings City with the bunny sticker, and head inside to get a stamp on their card. Once the kids have filled up the card up with 12 stamps from 12 different participating stores, (no purchase necessary), they fill out their contact information on the back of the card and hand it over to the last store keeper to claim a prize! All of the prizes are sponsored by Upstart Magazine, a local publication which is produced with the help of primary and intermediate school children and their teachers throughout New Zealand. Every completed entry gets a prize, plus all of the completed entry cards go into the draw to win a MEGA School Holiday Fun Pack (valued at $200) or one of four runners-up prize packs (valued at $100 each), thanks to Upstart Magazine. The major prize will be drawn at the Harcourts Hastings City Easter Night Market on April 18th, during the first week of the school holidays. Another free and family focused event that we are holding, in conjunction with Hastings District Libraries, is the Upstart Hastings City Bunny Hop. This will be held on Thursday April 11th, from 4pm to 6pm in Civic Square, Hastings. This is a free, family friendly event with lots of interactive and hands on activities for kids, including a colouring in competition, face painting, make your own bunny ears, egg and spoon races, an Easter rock hunt (and more!). There will be lots of spot prizes sponsored by Upstart Magazine, and every child who finds an Easter Rock will get a free copy of the Upstart Magazine, while stocks last. The colouring in competition winner will also be drawn at the Harcourts Hastings City Easter Night Market on April 18, so hop to it and make sure you’re in to win! Terms and Conditions: One entry per person. Competition runs from 1st - 14th April 2019. The judges decision is final and no correspondence will be entered into. The competition is open to children aged between 5-13 years only. Winners will be drawn at the Harcourts Hastings City Night Market at 6pm on 18th April. If the prize winner cannot be contacted within 3 working days, at the Hastings City Business Association’s option, that winner will forfeit the prize with no right of compensation and the prize will be redrawn. By entering this competition any participants are deemed to have given Hastings City Business Association and Upstart Magazine consent to contact them for marketing purposes. A raft of projects that will dramatically enhance and enliven Hastings’ city centre are about to get underway. 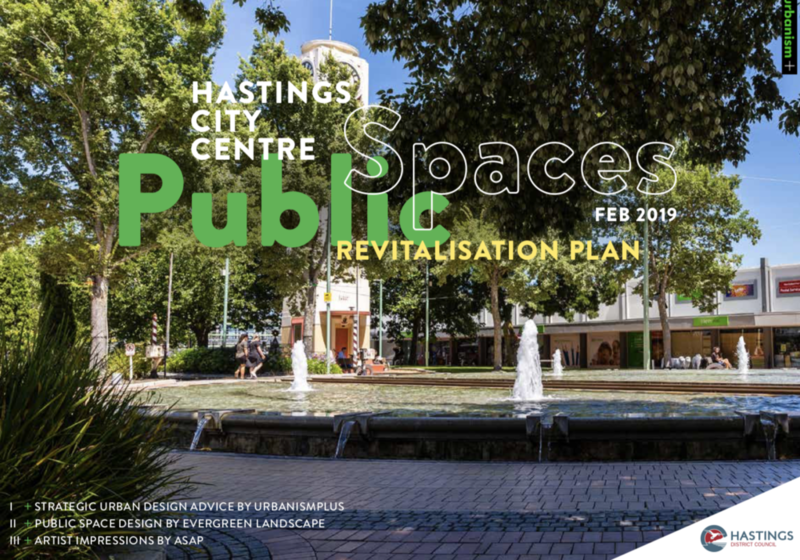 Seeing the Hastings District Council City Centre Public Spaces Revitalisation Plan in print, complete with a timeline, is very exciting, says Hastings City Business Association chairman Craig Riddiford. All but three of the 23 projects are already funded in Hastings District Council’s budget, and the bulk of them will be completed over the next four-and-a-half years. Several are due to be started before the end of June this year. “The Eastbourne St upgrade is underway, and the time-line shows that we will see more outdoor eating spaces, more pocket parks, and a start made on major improvements to the central plaza. “Our business association members are rapt with this news,” he said. “We are very pleased that Council has undertaken to get input from the business people within each improvement area as it undergoes final design. Members of the Hastings City Business Association are about to vote on whether to transform their association into a Business Improvement District. The central city area, bordered by Nelson St, St Aubyn St, Southampton St and Hastings St, has had a business association for 25 years. Owned and funded by the members with businesses and buildings within that area, it is focused on making Hastings central city a vibrant, distinctive and safe destination to work, shop and visit – thereby increasing business success, says the chairman of the association Craig Riddiford. “We have had a great number of successes over the past years, particularly in the retail sphere, but we can always improve,” he says. “The Business Improvement District model is widely used and proven in our main New Zealand cities and across the world. The main benefits are that the BID model sets in place improved and strengthened processes around the association’s relationships with, and reporting and communications to, stakeholders; principally our members and Council. The vote opens on March 1, closing on March 21, with all business and building owners within the defined area eligible to vote. For further information contact Craig Riddiford, central city accountant and board chairman; phone 021 046 5213. The crowds will flock to the central city plaza in Hastings on Thursday [February 14] to get togged up for the region’s biggest festival of the year. The Madness in the Mall Art Deco Market is all about getting your hands on authentic, affordable clothes, shoes and accessories - to the tune of great entertainment - for the four-day Art Deco Festival, says Hastings City Business Association board member Natasha Bird. Mrs Bird says the stallholders are always “fantastic”. Many of the retailers along the strip also put on their finery, adding to the “incredible atmosphere”. The market runs from 10am to 8pm, on Thursday, February 14, in the central city plaza, Hastings. The Art Deco Festival runs from February 13 to 17. The figures tell the story: Retail spending in Hastings has been rising every year for more than three years and the latest fantastic results show that there is no sign of a slow-down. “This would build on the great results we have already seen. A lot of our success is about working together; the Hastings City Business Association, our members and Hastings District Council. Figures released by Hastings District Council showed that over the past three years, growth in retail spending had steadily increased – ahead of the national growth average. “A great deal of effort has gone into the city, through events and marketing initiatives and a focus on the look and feel of the central area. It has helped build an inviting, thriving business district,” said Mr Riddiford. “As a board, looking across the improvements made to the city and the increased vibrancy and spending figures, we believe we should continue with our now tried and true strategy but I do believe the new structure will add benefits for our membership,” said Mr Riddiford. The first Hastings Leader of the year is back which means life is returning to normal. The holidays are mostly over and we’re looking forward to the changes and challenges that the new year will bring. For me, I’ve made the tough decision after nearly three years at the Hastings City Business Association to move on to a new role, so this is my final column. I’m leaving the team in great hands, and you’ll soon start hearing from the amazing Kelly Burgess, one of the new faces here in Hastings City. When I look back at the changes the city has gone through in the last three years I am amazed. Hastings is thriving. Hastings District Council are actively investing in the CBD and you’ll start seeing changes as new green spaces are created, the lighting is updated and the city is given a freshen up. The East Side has gone from an up-and-coming strip to a full thriving hot spot. Retail space is at capacity and with the Opera House opening in the next 12 months it will only go from strength to strength. The west side is seeing a resurgence with the new pocket park laneway opening up additional parking and adding a much needed green space in the heart of Heretaunga West. You’ll start hearing live music at lunchtimes over Summer coming from there as we start and activate that space. Bay Plaza continues to be a shopping hub. How many of us made 11pm shopping runs over Christmas? The team there are working hard to make sure that Hastings has access to some of the best shopping in Hawke’s Bay. I can’t tell you how much I’ve loved working at the HCBA over last few years. I’ve had the privilege of working with amazing people who have turned into life long friends. I’ve been welcomed into the Hastings Community with open arms and together we’ve strived to make our city a better place. But enough looking back, it’s a new year and time to look forward. Hurray, the sun is back and Summer is here! Last week we kicked off Christmas with a packed out Harcourts Hastings City Night Market in the heart of the CBD. Thousands of you came out to visit Santa and soak up the Christmas Cheer. Our next market is on December 20th and is chocka full of stalls to fill the Christmas stockings. The Twin City Stompers will be filling the CBD with Christmas tunes and we’ll have all your favorite food trucks. It’s going to be a fantastic way to cruise into the holiday break so make sure you grab the family and come down! In other Christmas news the Hastings City Christmas Countdown is back! We’re giving away amazing prizes every day between now and December 22nd. We’ve got some seriously cool prizes lined up and you can enter to win every day! Make sure you keep an eye on our facebook page @hastingscity to enter the daily draws. Santa’s Wonderland is now open opposite BJ’s Café in the center of town. The jolly man in red will be there Tuesday-Saturday until December 22nd. The Wonderland is packed with intricately decorated trees, a Lego Christmas Village display and a Selfie Wall! Entry is free but if you would like to give back we gratefully accept food or coin donations to the Hastings Food Bank Trust who do amazing work all year round, and especially at Christmas, making sure that those in our community who need it have enough in their cupboards. This is it people. The final push to Christmas is on. It’s almost December and Santa has come early to Hastings. As all my friends can tell you Christmas turns me into a giddy, singing happy fool and the thing I love the most is seeing the look on a child’s face the first time he sees Santa. The Hastings Santa’s Wonderland is the place to make the magic happen. Open on Thursday November 29th back in the city mall area the wonderland is a forest of over 150 Christmas trees, bears and decorations leading to Santa’s throne. Kids can come and meet Santa and give him their lists and Mum and Dad can grab a few pictures too. The Wonderland is free but if you can we would love a donation of food or coins for the Hastings Food Bank. The Wonderland is open from 10am to 3.30pm pm Tuesday through Saturday with extended hours over the week of Dec 18th and super special late hours during the Christmas Night Market on November 29th and December 20th. There are play areas for the kids this year and the elves have been working hard and have extended last years’ magical Lego Christmas display. Last year Santa met over 13,000 children and he is expecting even more this year so make it an outing for the whole family. He even has a Photo frame to get a picture for your holiday greeting. Bring your cameras or phones for pictures and make family memories that last a lifetime. This year we are introducing a special hour set aside for people with sensitivity to bright or flashing lights and loud music. If you are affected, please join us on Wednesday mornings between 9-10am. An amazing, versatile space for performance, markets or just reading a book in the sun! This wonderful inner city greenspace has a stage that lowers down for all types of performance, including a basic lighting and sound system. We love bringing live local entertainment to the people at the Night Market. It's a great way to set the scene, get people involved and to showcase some of our talented artists, musicians and performers.